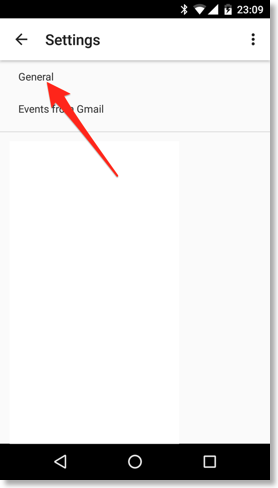 Email reminders: When using this reminder, Google will send an email to your Google Calendar email address. 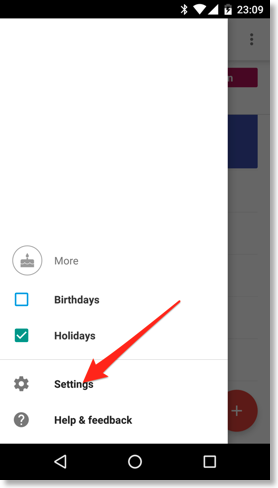 SMS reminders: When using this reminder, Google will send a SMS message to the mobile phone number that you have configured on the Google Calendar website under “Settings > Calendar settings > Mobile setup”. Works only with Google Apps for Work, Education, and Government accounts. Or you can install CalenGooSMS then it works also with normal Google accounts but then the SMS messages will be sent by your phone. 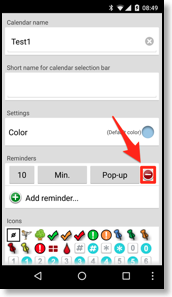 Popup reminders: These reminders will display a popup window in your browser and on your phone. While the email and SMS reminders are completely handled by Google Calendar, the popup reminders are displayed by CalenGoo on the phone and have a few additional configuration options, please see below. 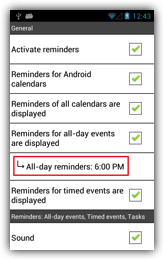 To let CalenGoo display these pop-up reminders, please turn “Settings > Reminders > Activate reminders” and “Reminders for Android calendars” on. If you have problems with these pop-up reminders, please see fix pop-up reminder problems. 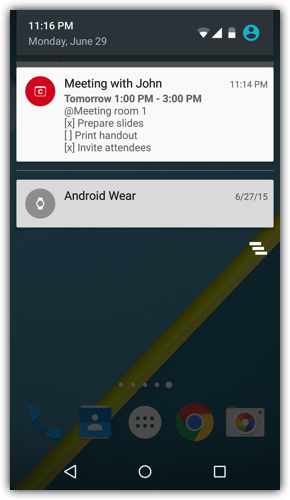 To add reminders to your events, scroll down in the edit view and tap “Add reminder...”. 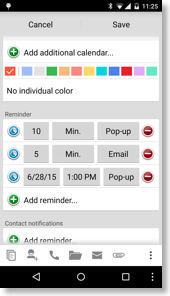 You can have up to five reminders per event. If you often use the same reminders, you can configure default reminders that are automatically added to new events that you create with CalenGoo. 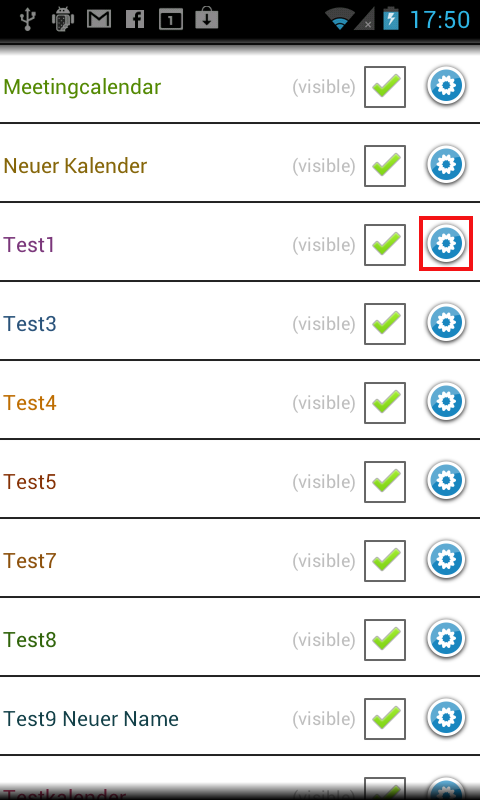 You can configure these default reminders under “Settings > Reminders > Reminders for new events”. 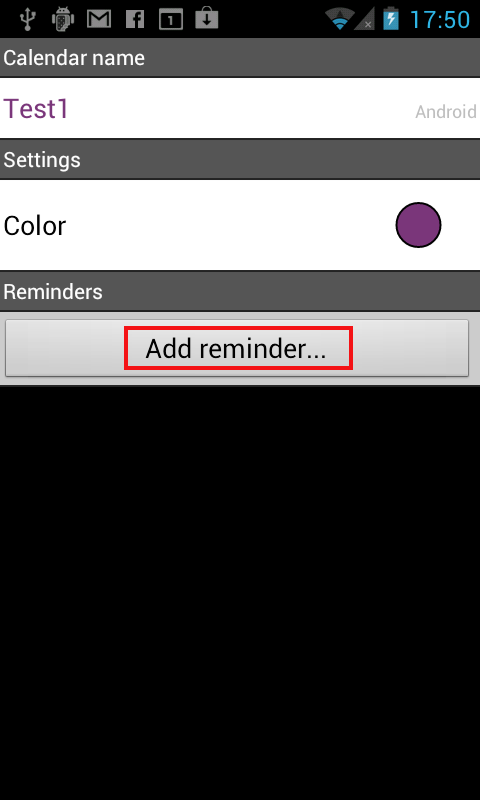 To remove such a default reminder, tap the red “-“ button at the end of the line. As you can see in the screenshot the reminder can either be postponed for a certain time (e.g. 10 minutes) and will be displayed after that time again. Or it can be postponed until a certain time before the start of the event (e.g. "5 minutes before start"). 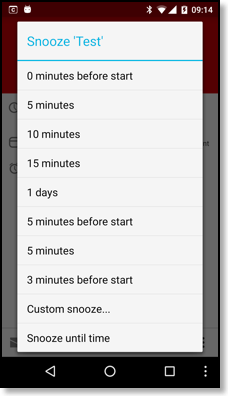 You can configure this for each of your snooze options (under "Settings > Reminders"). 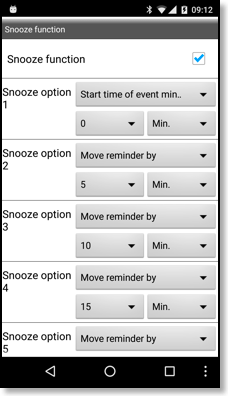 The snooze options (e.g. 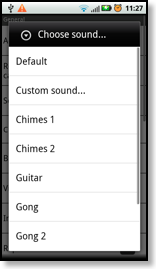 1, 5, 10 and 15 minutes) are configurable under “Settings > Reminders”. 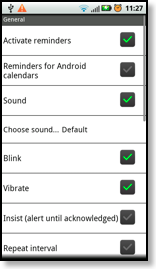 Under "Settings > Reminders > Show pop-up window" you can configure if you would like to get the reminders displayed as status bar notifications or as a pop-up window. Normally you don’t want to be reminded at 12am for an all-day event that starts on the next day. 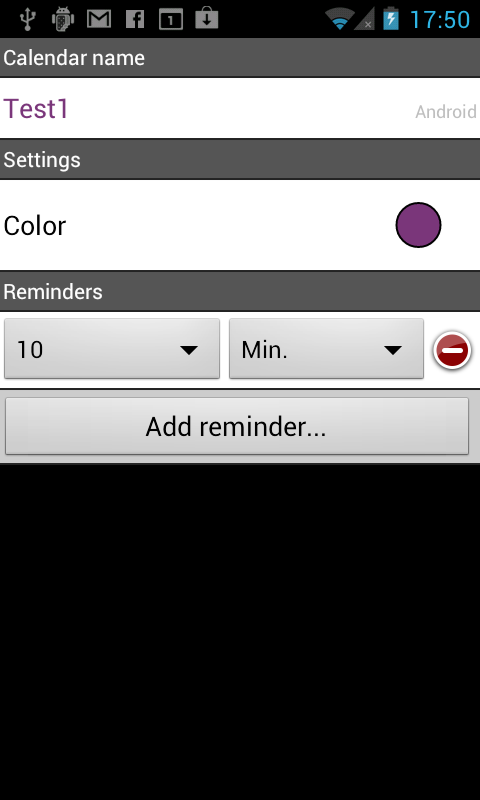 For this purpose you can configure the time for all-day reminders in CalenGoo under “Settings > Reminders > All-day reminders”. The time you use there will be the base time. Reminders will be relative to this time. E.g. if you set “All-day reminders” to 6pm and add a reminder “30 minutes before the event”, it will remind you at 5:30pm. 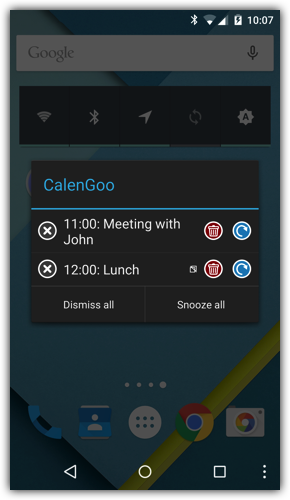 The detail view will also display the time of your all-day reminders, i.e. "5:30 PM" in this case, please see the screenshots on the right. 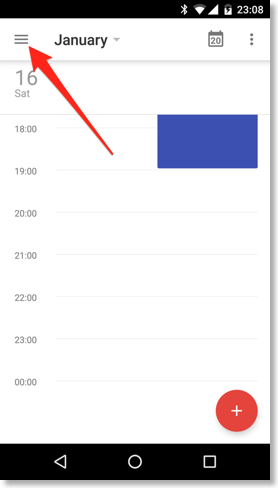 In 2015 the Google Calendar website changed its own behavior of all-day reminders. 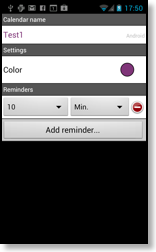 Now you are able to specify a time when you want to be reminded. E.g. you can set a reminder "0 days before at 9am" to get a reminder on the same day at 9am or you can set a reminder "1 days before at 7pm" to get a reminder in the evening of the previous day. 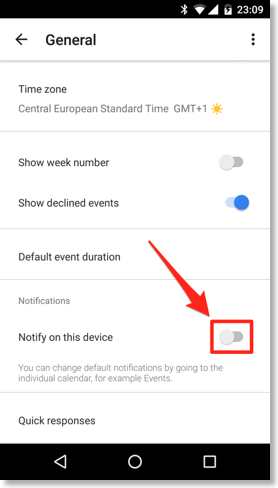 However since the sync protocol hasn't changed, Google Calendar cannot send reminders that are on the same day as the all-day event to CalenGoo. Because it has to specify for every reminder how many minutes the reminder is before the start of the event. And when you are reminded at the same day, it is after the start of the event. So such reminders are skipped. Only reminders "0 days before at 12am" and earlier are sent from Google Calendar to CalenGoo. This change also means that Google Calendar now specifies the all-day reminders relative to 12am of the day where the all-day event is. 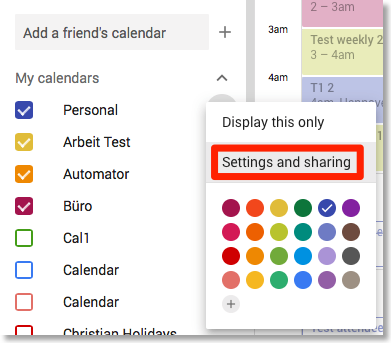 So to get the reminders at the same time as set in Google Calendar, you have to set "Settings > Reminders > All-day reminders" in CalenGoo to "12am". 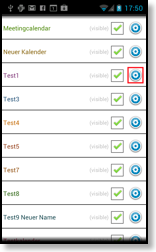 The reminders can also be repeated at regular intervals until you acknowledge them or the configured maximum is reached. Just turn the "Repeat alarm" option on. 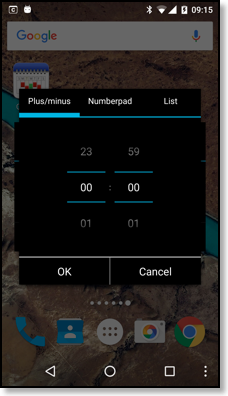 If you configure a maximum of “0” under “Repeat up to x times”, it will repeat endless. To acknowledge a reminder, open the notification list by doing a swipe gesture from the status bar at the top to the bottom of the screen. Then tap the reminder’s notification in the list that appears. 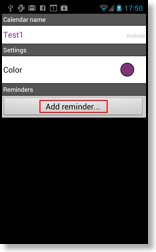 Another option to repeat a reminder is the "Insist (alert until acknowledged)" option. It is only available if "Show pop-up window" is turned off. 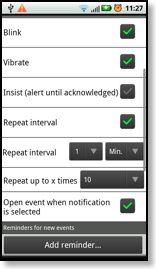 It uses Android's "insist" function for the notification which means that the sound is played and the phone vibrates until you turn the screen on or press a button to stop the alarm. 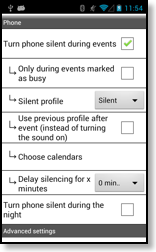 However because this is a behavior of the Android system, it can work differently on some phones if the manufacturer decided to change the behavior of the "insist" function. 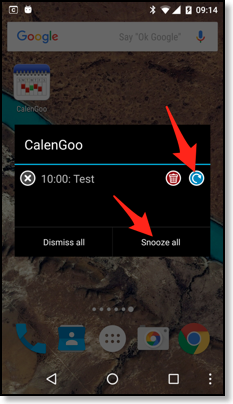 If you are using "pop-up" reminders, you can (optionally) configure CalenGoo to speak your reminders, i.e. to speak the title and location of an event when the reminder is due. 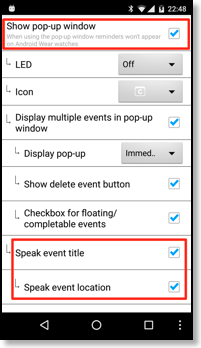 You can also limit it to certain calendars so that no all your events are spoken. 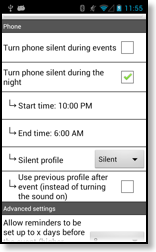 Using the options "Turn phone silent during events" and "Turn phone silent during the night" you can let CalenGoo mute your phone while an event is running or during the night. 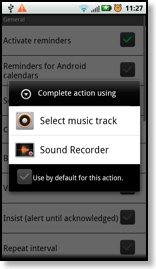 You can also limit it to events of certain calendars, only "busy" events and other things. Open the event you got a reminder for in Google Calendar. Check if you can see the reminder you got (email, SMS, pop-up for the time when you got the reminder). If you have created this event with CalenGoo, the reminder was probably added by CalenGoo. 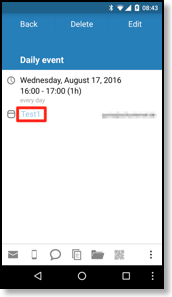 It automatically adds those reminders to your new events that you have configured under “Settings > Reminders > New event’s reminders”. Please see the “Default reminders” section above. If they are not there, then there is another option at least for "pop-up" reminders. 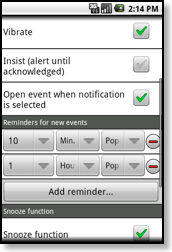 In CalenGoo you can configure "pop-up" reminders that are automatically used for all events in a certain calendar. You can configure them by tapping "Settings > Visibility/Download" in CalenGoo and tapping the blue button behind the calendar’s name or by tapping the calendar name in the event details. Please see the "Automatic reminders" section above. However email and SMS reminders are always sent by Google Calendar, they are not sent by CalenGoo. So if you get unwanted reminders of one of these types, you have to find out why your Google Calendar contains these reminders as described above.